If, like me, you use an "ad blocker" in your web browser to improve your web experience then you've likely run across so-called anti-ad blocker measures on sites like Forbes, Wired, and other big-name news websites. Over the past year many of these sites instituted measures that prevent you from viewing content unless you turn off your ad blocker. Click the AdBlock icon that appears near the top of your web browser and select the "Don't run on this page" option from the pop-up menu. Done! This step will deactivate many site's "anti-ad block" content blockers on all of a site's pages, not just the single page you allowed ads on. Allowing ads only on the initial page can help skirt ad walls. Here we see the AdBlock plugin blocked 16 ads on the home page of "Forbes.com". Many of the current anti-ad blocker solutions interpret this action as you having deactivated ad block for the entire site and so will allow you to browse all pages without issue. On a site like Forbes.com you won't even have to see ads on the page you "allowed ads" on since Forbes' solution uses an intermediary page to shield content. 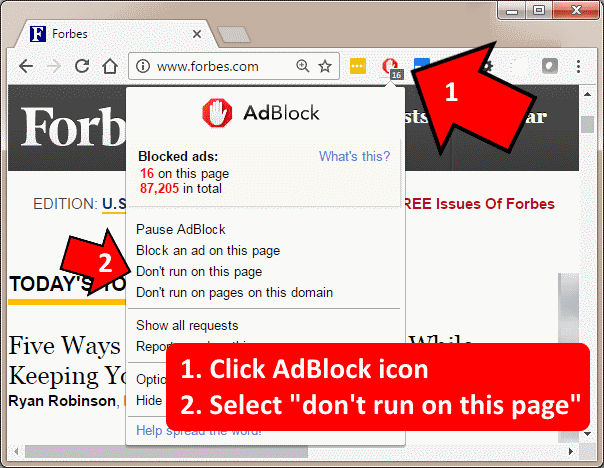 In other words, all you'll have done is to "allow ads" on the intermediary page which Forbes will no longer show you since the site believes you've deactivated your ad blocker for the entire site.